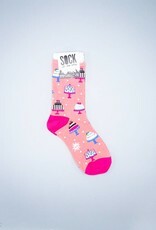 If you looove vegan cakes, donuts, or any sweet treat, you will be enamored with these adorable women's crew socks. With a cake pattern, peachy color, little polkadots scattered throughout, and white scalloped tops, these socks are as sweet as can be! They are sure to complete the recipe for a great outfit. 49% Polyester, 48% Cotton, 3% Spandex. Made in Korea.